The Rezortify's Blog > For Shopaholics > Window Shopping In Jaipur Down The Aisle! This blistering heat and Rajasthan, an offbeat permutation for some but definitely a hot tourist spot for shopaholics! The present stint in Jaipur might force the mercury to reach 50, (oh yeah, apart from IPL scores Jaipur temperature touches that par too!) but the shopping offerings there can simply out-stand your expectations! 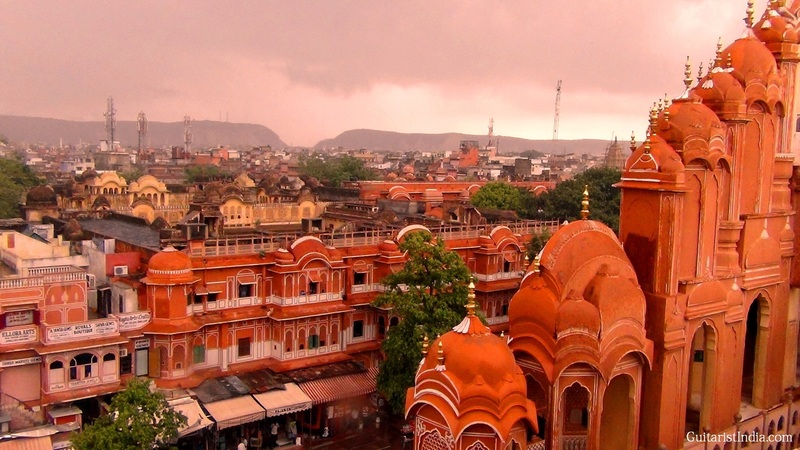 Rajasthan’s beautiful Pink city Jaipur was the stronghold of a clan of rulers whose three hill forts & series of palaces in the city are important attractions. Branded by Pink city, the acronym is gained because of the color of the stone which is used exclusively in the walled city. Jaipur – A treasure trove for shoppers! Rezortify holds no responsibility if your better-half digs holes in the pocket for shopping is irresistible because of wide range of handicrafts available in the market. The city is one of the most important centers in the world for cutting & polishing precious and semi – precious stone & diamonds. The local Jaipur ‘Kundan ‘ jewellery is famous throughout the world. Yes, you read it right! Do not forget to flaunt your jewellery in the next family marriage (the occasion where most fashion statements are made when twenties of eyes glare the aunties!)! The main attractions are the exotic batik painting, blue pottery and the printed textiles (blocks) of sanganer and bagru’s tie in addition to dye fabrics. Mojari, the folk shoe often wear by males during weddings and females as a part of fashion statement is yet another big attraction. Sandal wood carving items and beautiful stone carving decorate the street. Just do not miss the main shopping centers there comprising of (but definitely not limited to!) Johari Bazaar, Nehru Bazaar, Bapu Bazaar, Chaura Rasta, Tripolia Bazaar and M.I. Road (Husbands and boyfriends, carry your beloveds at your own risk!). It is a heaven for shopaholics and indeed a great tourist attraction. Let’s have a quick window shopping in Jaipur! Johari Bazaar is the place where you can buy Jewellery, precious and semi- precious stones (loose), tie & dye sarees, textiles (leharia bandini, zari, gota, mukesh and embroideries), precious enamel work, Jaipur speciality – namkins ( snacks ) and LMB ‘s paneer ghewar. And my personal favourite, Jaipur Bapu Bazar! A treasure- trove of typical Jaipuri stuff- salwar suits, bed sheets, quilts, jaipuri jutis, cushions, kurtis & readymade suits. Salwar suits, kurtis and bed sheets are perhaps the best selling items here. A perfect Jaipur kurti market! Sanganeri prints, batik prints, bagru prints, bhandhej suits and bedsheets are very much in demand. It is the busiest bazaar of Jaipur because of its typical jaipuri stuff and to get what you what you might have to navigate through crowded balconies full of people and clothes. While shopping you can eat chat pakoris and especially water balls (Gol Gappas). Link road is a good for artificial jewellery, home furnishing and bangles. Jaipur Nehru Bazaar is situated near Ajmeri Gate, the centre of Jaipur. Nehru bazaar has shops for readymade garments, footwear, gifts and households items. And Jaipur does full justice with book worms (kidding!) too! Chaura Rasta – Books, books and more books this is what chaura rasta is famous for. You can find a wide range and variety of books and stationery. Jaipur Tripolia Bazaar is famous for utensils, tin trunks & metal work. M.I.Road or Mirza Ismail Road is an ideal & ethnic place to shop for jewellery and branded readymade garments. This is the place where formal shopping takes place (the one with class, no claps!). Almost all branded showrooms stand on M.I.Road. Badi Chaupar – It is adjacent to the famous Hawa Mahal. It is famous for mojaris, handicrafts, antiques, jaipuri print dress material and turbans; Bhindon Ka Rasta and Kalyanji Ka Rasta is famous for marble statue carving; Chandpol is famous for prickles & sharbats (foodaholics, sharpen your ears! ), Ghee walon ka rasta & Haldiyon ka rasta for Jaipur special sweets, digestives & suparis; Jaipur Hawa Mahal for antique textiles, quilts costume, fashion accessories & leather crafts; Choti chaupar for Rajasthani furniture & straw chairs (mudas). This blog is very informative, Really interesting. I would like to go at this location in future.